October play and learn activities for kids are some of my favorite during the year. It’s such an exciting month and the season of fall is full of golden treasures, as well as other bright colors too. Nature seems to invite us outdoors to enjoy the sun as much as we can since the days are getting shorter and shorter. Play, of course, has it’s own magic but we’ll try and do some of our own too with cooking and science. As for learning, there’s sequencing, making patterns, following instructions, counting, sharing books and stories, singing, and more. Print off this calendar below and enjoy these October plays-of-the-day! Summertime, and the livin’ is outside. 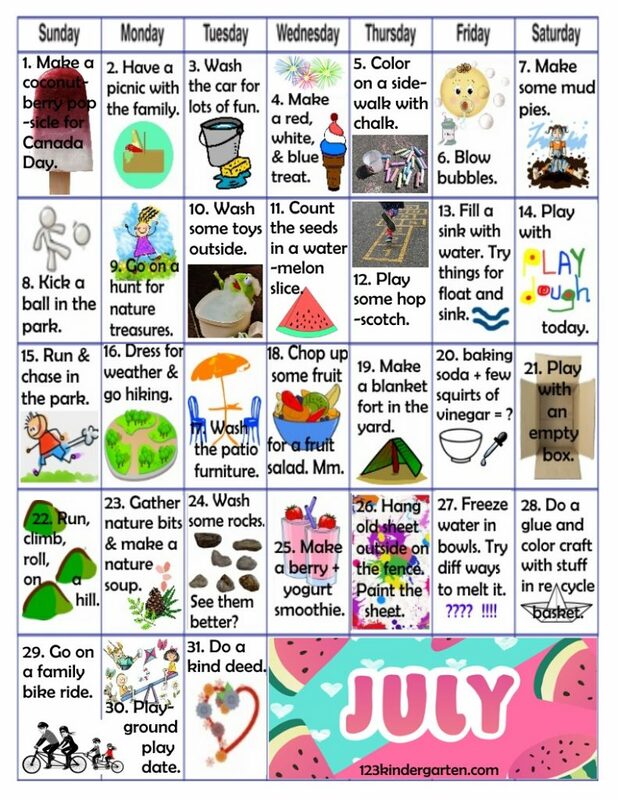 Well, we try and get kids outside so here is a whole month’s calendar of fun and learning summertime activities for kids including lots of ideas for outside! 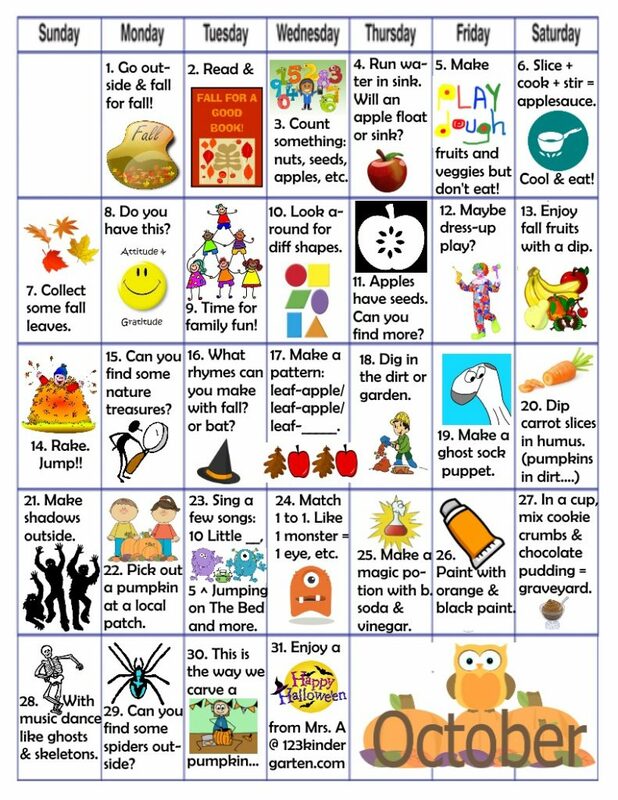 So enjoy this calendar of play activities. If some play isn’t convenient for your family, change the fun and go for something else. Let the ideas inspire ones of your own. But most of all, come and PLAY! 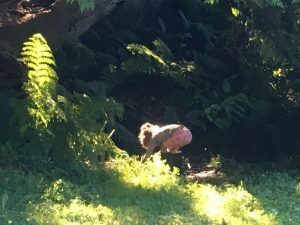 Simple Summer Nature Fun for Kids – Let’s Celebrate Summer! 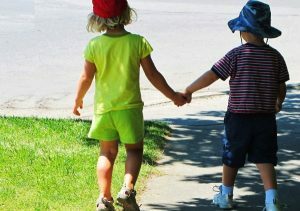 Summertime and the livin’ is …outdoors, I hope, especially because kids need nature time! Let’s head outside for some simple summer nature fun today. Wherever your family lives, dress for the weather, be it boots and umbrellas or hats and sunscreen. 1. One of the simplest outdoor nature activities is to check the weather. Open the door and go outside. Look up at the sky and down at the ground for clues. Feel the air with your body. As you put out your hand, say hello to nature and wave. 2. A walk around the block can be an adventure quest. What’s there to see? Sometimes, nature hides in hidden pockets in city spaces, but somewhere there will be grass, trees, and flowers. Ants might be crossing the sidewalk. Turn over a rock to see if there are any bugs and crawlie creatures. Besides eyes, use hears to listen for nature too. 3. Time in nature is food for the mind and the soul. 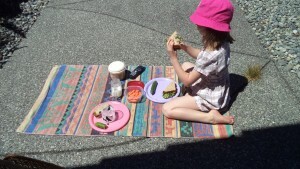 Pack some food for the body and go for a picnic outside. 4. A nature collection is one way to bring nature home. Some things to collect could be rocks, shells, sticks, and plants. 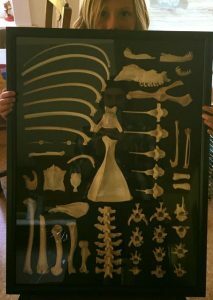 This is a photo of a young boy who lives near the ocean and finds bones! 5. Make a blanket fort outside. Since this is the longest day of the year, it’s also the shortest night. How soon is the sun up where you live? Backyards and parks are giant trunks with nature gems and other treasures for some simple summer nature fun. And the key? Just some T.I.M.E. If just seeing pictures of nature has a positive impact on all aspects of health, how many more vitamins is actually spending time in nature? Richard Louv, who first wrote about nature-deficit disorder in children, calls nature Vitamin N. In his book, Vitamin N: The Essential Guide to a Nature Rich Life, Louv reminds us kids need regular doses of this vitamin. Daily ones, preferably. Did you know that kids are now spending less time outdoors than prison inmates? Even prisoners think that is a depressing statistic. Spending time outdoors can be spontaneous or planned, and best of all, easy and simple. 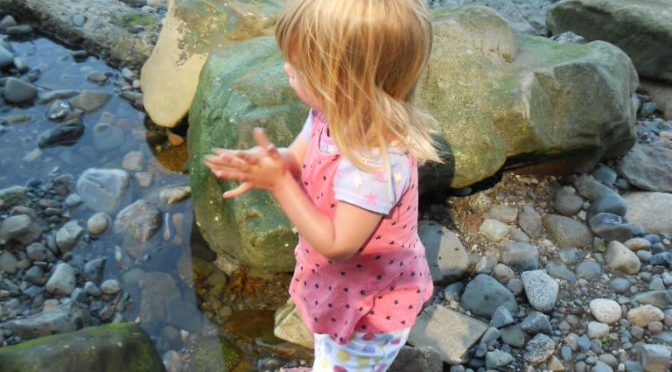 What will you do for some simple summer nature fun? 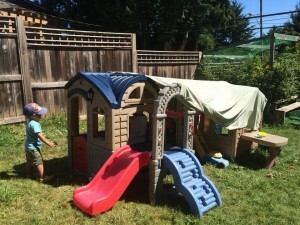 Play ideas are shared everyday on the 123kindergarten blog.